This is a very famous Konkani dish high in proteins and thus very healthy. Very simple, tasty and easy recipe. 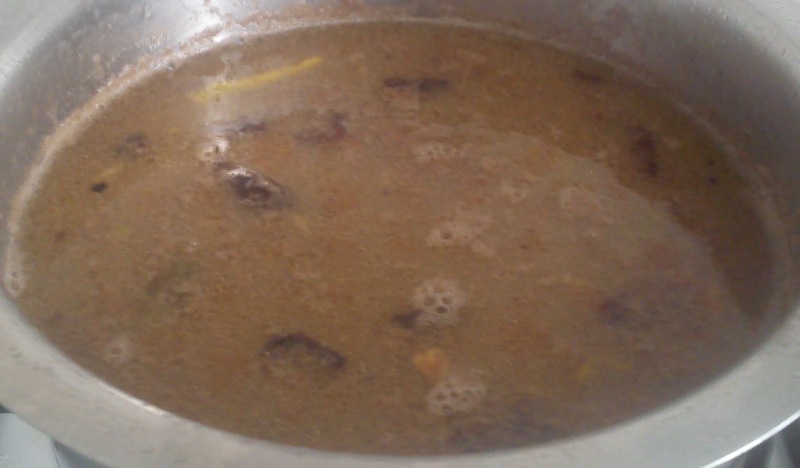 Kulithu means horse gram in Konkani and thus the name Kultha Kadhi/Soup. Goes well with plain rice. In Villages, the cattle's are fed with cooked horse gram and the water used to cook is used by the people as a soup. They also make a thick syrup of this by boiling for hours and store it. And later use it whenever needed. Some people call it as kultha saar-upkari which means gravy and a dry item of horse gram. They boil the horse gram in a water and then they separate the water and horsegram. The water separated will be seasoned with garlic and chilies and will be called saaru and the separated horse gram will be seasoned with garlic and chilly and this is called upkari. I prefer not to separate and have it together. Can use yellow or old cucumber along with this. Can separate water and horse gram if needed. It is optional to soak horse gram. Some of them don't prefer to soak it and directly cook it. But i am soaking it as it takes less time to cook. I am making paste of horse gram to make my gravy thick. If you don't want your gravy to be thick then ignore this step. Wash and Soak Horse Gram for 3-4 hours. In a cooker add horse gram and water. Wait for 2-3 whistles. On cooling, grind 1/4th cup of horse gram in a mixer jar. Can shift the cooker content (i.e., Soup) to a pan along with horse gram paste. Add tamarind water and salt. While it is boiling, heat a spatula with oil for seasoning. Add garlic, dried red chilies and green chilies. Wait until garlic color changes to brown. On color change, switch off the stove and add this seasoning to the soup.and serve hot.